Mint Chocolate Chip Ice Cream Cake. 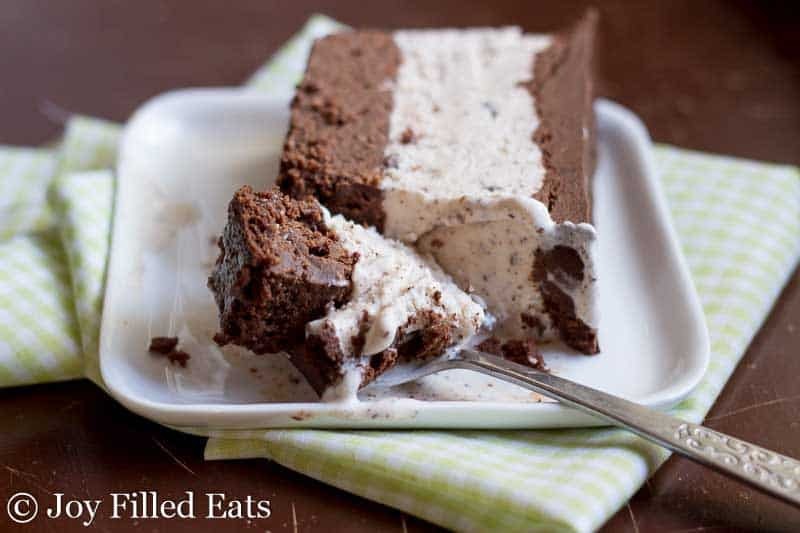 With a layer of brownies, and then a layer of mint chocolate chip ice cream, and then a layer of chocolate ganache this beats Carvel any day of the week. My kids love mint chocolate chip ice cream all year long. I prefer it around Christmas when candy canes appear in the stores. (Or should I say September? Because we all know that is when Christmas decorations are starting to appear nowadays). When I made my Fudge Brownie Pie last week I realized I should’ve halved the batter. I had way too much batter to pour into the pie crust. I carefully divided it and baked half in the pie and half in a loaf pan. 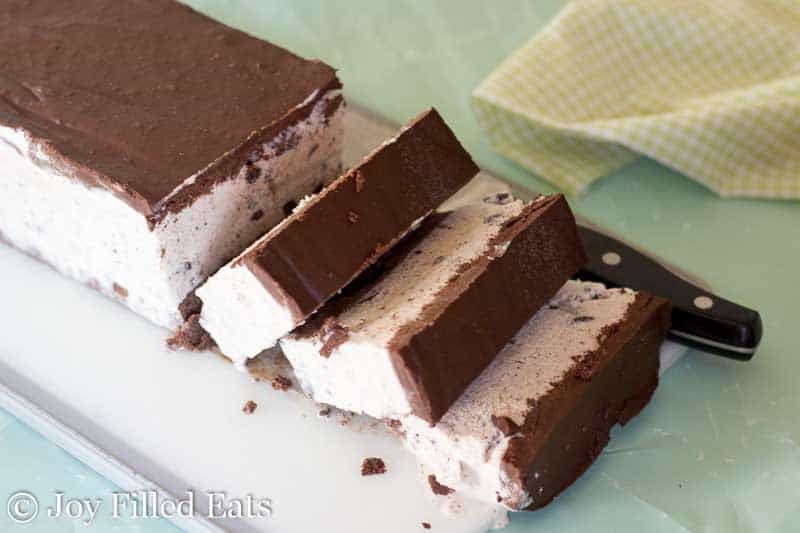 I wasn’t exactly sure if I wanted to make ice cream sandwiches or an ice cream cake. 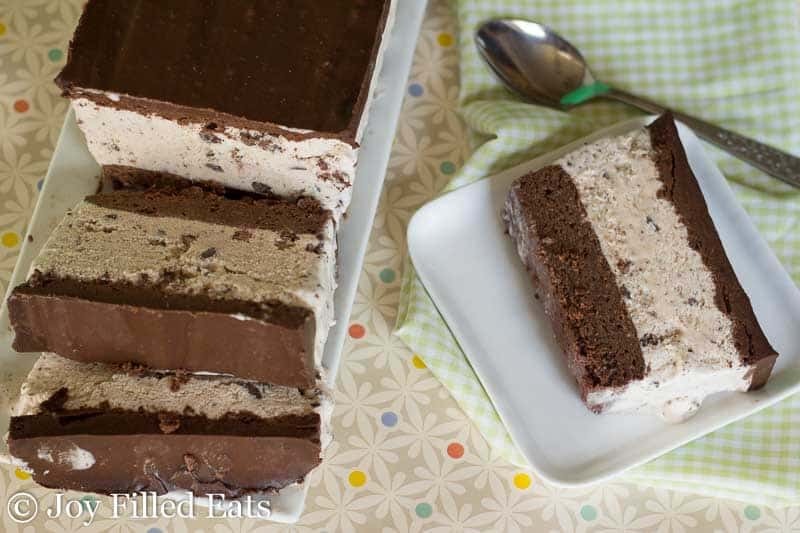 This Mint Chocolate Chip Ice Cream Cake looks like it has a ton of ingredients but many are repeated. If I’m counting right it only has 12 individual ingredients and it is easier to make than it looks! Mint Chocolate Chip Ice Cream Cake. 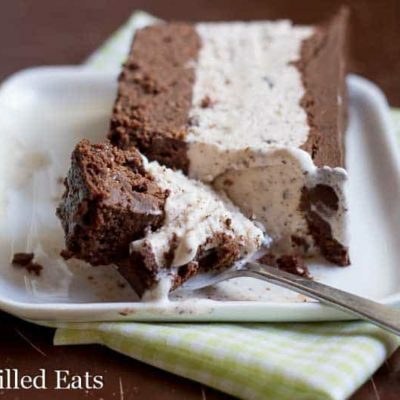 With a layer of brownies, mint chocolate chip ice cream, & chocolate ganache this beats Carvel any day of the week. Melt the chocolate and butter in a glass bowl in the microwave. Add the sweetener, vanilla, flours, and eggs and stir until smooth. 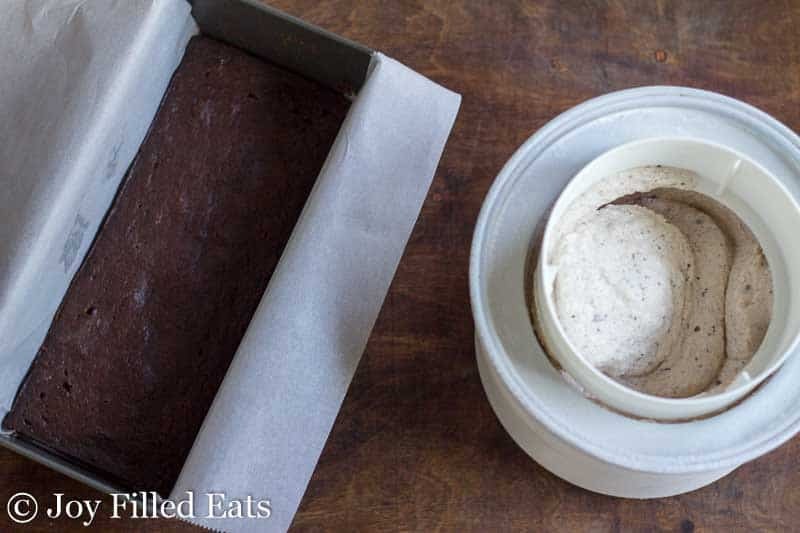 Line a loaf pan with parchment paper and spray with cooking spray. Spread the brownie batter on top. Bake for 25 minutes. Cool completely. You can either make the brownie base a day or two ahead or make it the same day as the rest of the cake. Just make sure to chill it for at least an hour in the refrigerator. It should be very cold before proceeding. To make the ice cream combine all the ingredients in a blender and blend until smooth. Pour into an ice cream machine and churn according to the manufacturer's instructions. 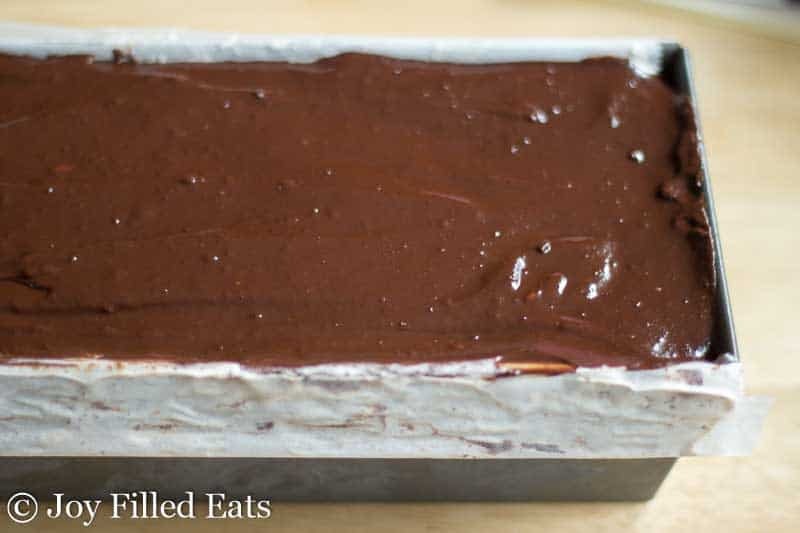 When the ice cream finishes churning spread it on top of the chilled brownies. Freeze for at least one hour before adding the ganache. To make the ganache microwave the chocolate and heavy cream at 30 second intervals until the chocolate is melted. Stir in the sweetener. Cool to room temperature. Spread on top of the frozen ice cream. Let this sit out for 20 minutes before slicing. 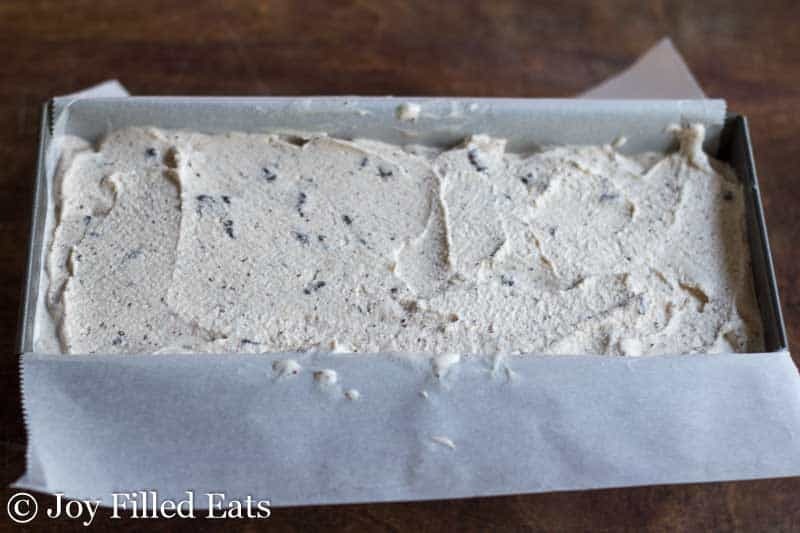 Simply lift the ice cream out of the pan by the parchment. Slice it on a cutting board with a sharp knife. Enjoy! This recipe is phenomenal but my brownie was very thick in the pan and froze so hard I was unable to cut the cake. I skipped the ganache but loved the flavors of this so much. Any tips to make the brownie less frozen? Did you let it sit out for at least 20 minutes before slicing? As long as I do that and use a sharp knife it cuts easily. If your freezer is very cold it may need to sit out longer. 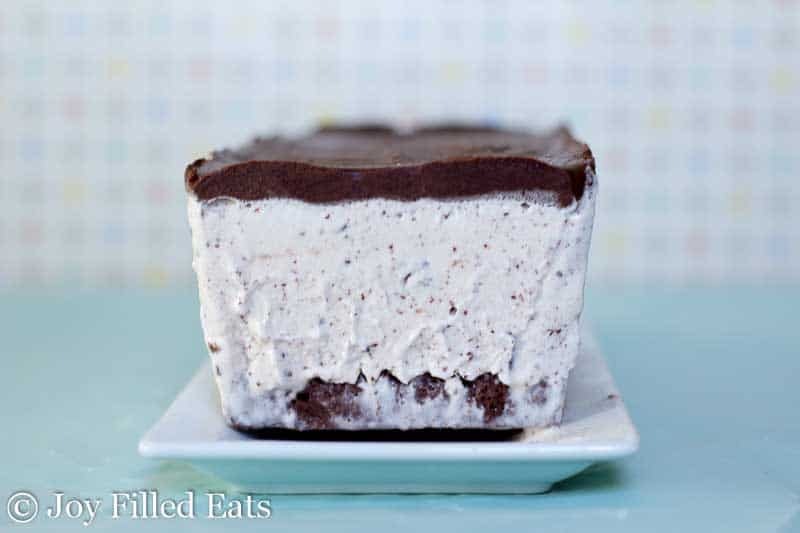 This is by far the best homemade ice cream! My whole family loves it and requests it for birthdays. I recently quarupaled the recipe for my husbands 40th birthday and it was a hit with all the guests.